Add on for Microsoft® Outlook ® to Protect You from the Most Common Email Sending Mistakes. SendGuard prevents embarrassing mistakes that can make your emails look unprofessional and waste your valuable time. SendGuard is an add on for Outlook that installs inside Outlook so that you can continue to work the same way you always have. 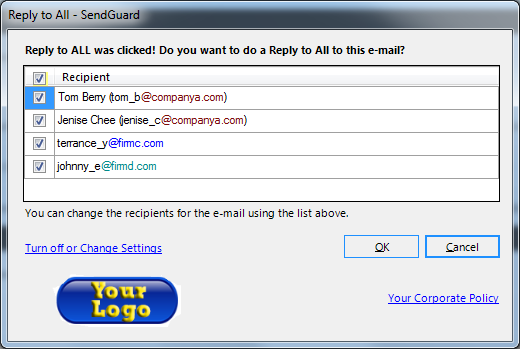 SendGuard will automatically check all emails as they are being sent and warn you if it detects a potential problem. SendGuard protects you in 5 main areas. SendGuard is in integrated product that includes all (plus more) of the protection outlined below. Outlook has a very handy feature called Auto-Complete which suggests names and email addresses as you begin to type them. Unfortunately this features makes it very easy to accidentally send an email to the wrong person. The web is full of examples of wrongly sent emails and the associated risks (including one that may have led to a $1B settlement). 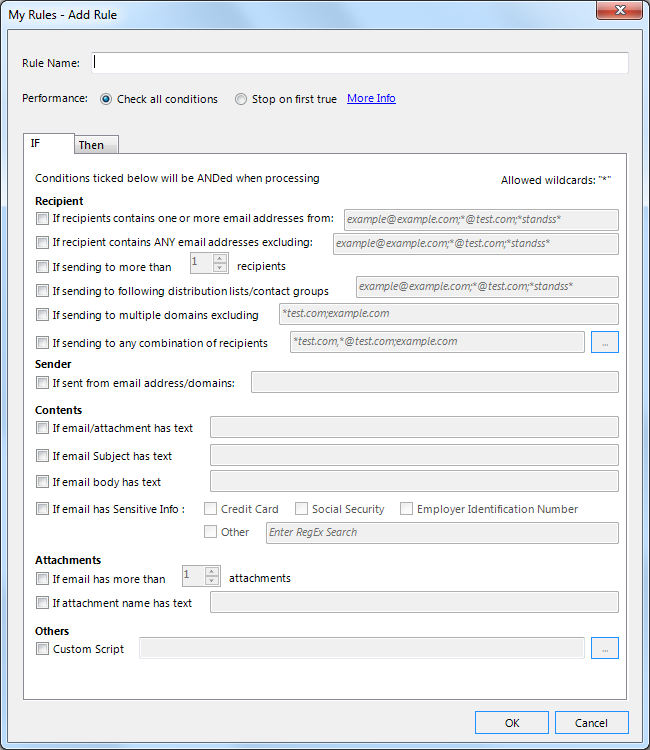 Send Confirm protects your company from similar mistakes by confirming that you are sending the email to the intended recipient. You can use a simply prompt to simply get the user to confirm that the email is being sent to the correct people. The domain is actually highlighted in red to quickly highlight to the sender if the email is being sent to the wrong company. Or you can use the more powerful confirmation prompt that displays both attachments and recipients. 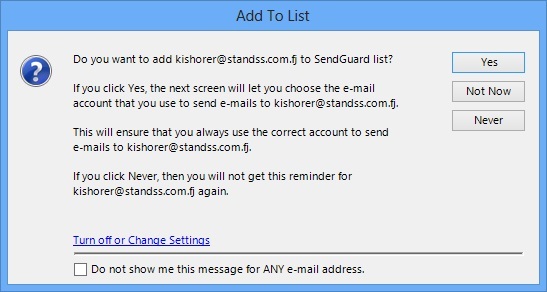 You can make changes to the recipients and attachments directly from this screen without needing to go back to the email. 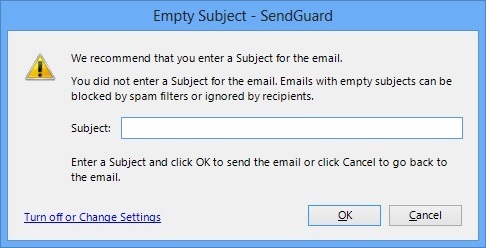 Note: Send Confirm for Outlook is also available separately if you do not need the rest of the functionality of the full SendGuard. You do a Reply to All on any email. This can be turned off but many users prefer to get confirmation so that they are not accidentally communicating their thoughts to the wrong people. 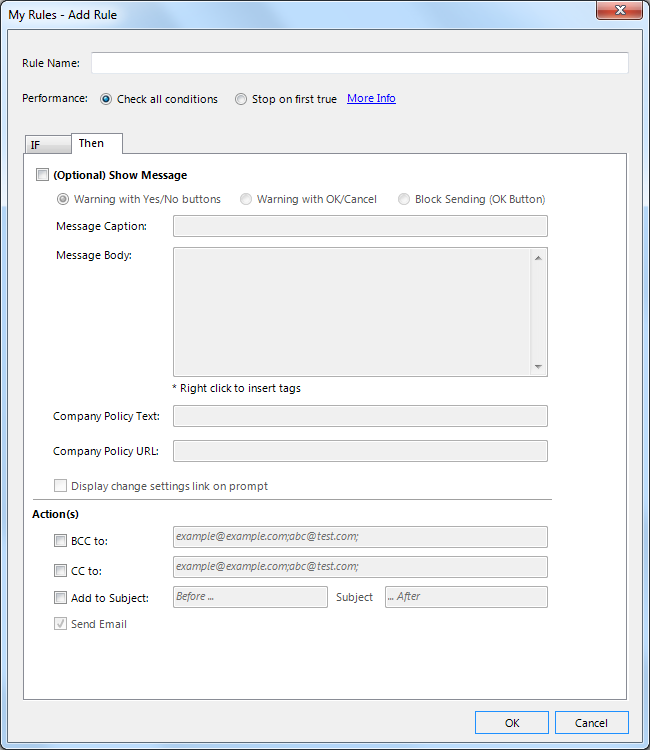 Send Rules for Outlook lets you create you define your own Rules that will be run whenever an email is sent out. You can define as many different Rules as you want. Use the THEN tab to define the actions that the computer should take place if the conditions on the IF tab are met. You can choose to show a message to get the user to confirm if the email still gets sent out, automatically BCC the email to another user and more. Do you have more than one email account setup in Outlook? Using the wrong email account to send an email can make you look unprofessional and cost you business. Our add on for Outlook lets you set a default email account for each person you communicate with so that you always use the correct email account. 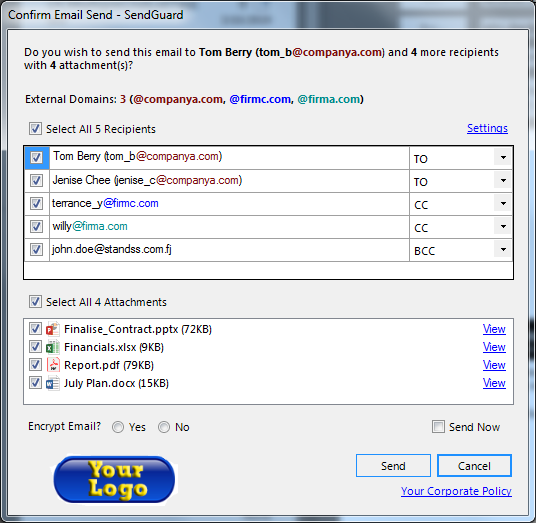 If SendGuard does not recognize the email address of the person you are writing to, it will let you assign a default email account to it. The next time you try and send an email to that person using the wrong account, SendGuard will automatically warn you and let you send using the correct account at the click of a button. Have you ever wished that you had NOT sent an email? Maybe your response was "undiplomatic" because you were angry when replying. 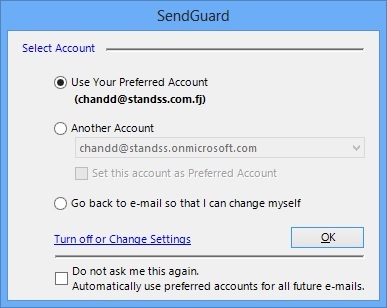 This component of the SendGuard, add on for Outlook can delay the sending of your emails by a fixed number of minutes (set by you) so that you can get some time to change your mind. 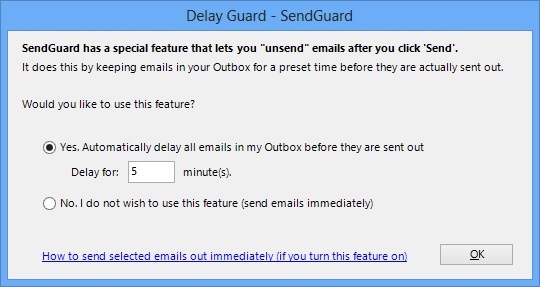 The delay can be automatically applied to outgoing emails or SendGuard will check with you before delaying an email. 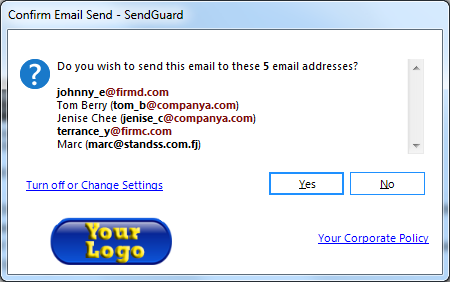 You can also easily setup SendGuard to either delay all emails or only emails to certain email addresses. HBlank Subjects can also be a problem. In addition to making your email look unprofessional, it also increases the chances that the recipient will ignore your email because it is not immediately apparent what your email is about. In addition many spam filters automatically classify blank subject emails as spam. 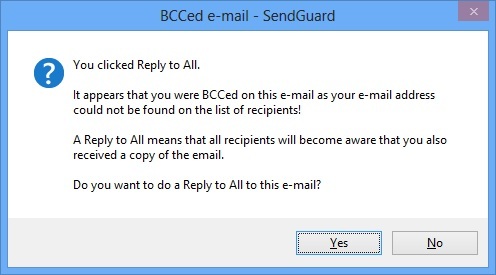 Send Guard will warn if you try and send an email with a blank subject. You needed to contact someone, found an old email from them and clicked Reply to create an email to them. The problem is that you forgot to change the Subject which will may annoy the recipient and possibly delay a response.